This website was created after the 50 year anniversary of the detonation and you can find here videos of the detonation, maps of the location as well as some interesting facts. 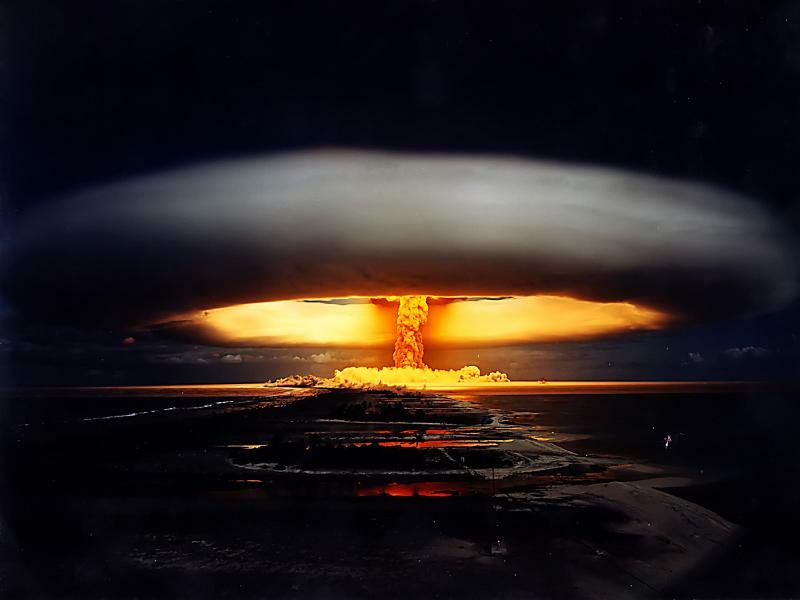 The 27-tonne Soviet Tsar Bomba (king of bombs) was the most powerful weapon constructed. Officially named AN602 hydrogen bomb, it was originally intended to have a yield of 100 megatons, but this would have posed problems with the radioactive fallout. Later, the Tsar Bomba was reduced to have a yield of only 50 megatons of TNT. In an atmospheric test in 1961 it had a yield of 50 megatons - 3,300 times as powerful as the Hiroshima bomb and 1,400 times as powerful as the Hiroshima and Nagasaki nuclear bombs combined. The bomb served no military purposes. For that, it would be too heavy to carry and there was no plane able to do intercontinental flights with such a load. The idea of creating a bomb of this power first appeared on July 10 1961 in a meeting between Khrushchev and the senior weapon designer, Andrei Sakharov. Initially, the bomb should have had a yield of 100 megatons, but this was changed in a later stage since a bomb that big would have posed serious safety issues and it would have affected inhabited parts of northern Soviet Union. The development of the Tsar Bomba was rushed, since Nikita Khrushchev wanted the bomb to be detonated during the 22nd Congress of the Communist Party held between October 17 and October 31 1961. The development team consisting of Victor Adamskii, Yuri Babaev, Yuri Smirnov and Yuri Trutnev had little time to prepare the bomb so they rushed everything. Assembly was carried out in parallel with designing. The design of the bomb posed serious questions. Its weight of 27 tones was two and a half times the Tu-95's normal weapon loads and close to the plane’s total weightload. Since the Tsar Bomba was too big, the Tu-95 had to be slightly modified; the bomb doors had to be removed. Also a custom parachute had to be built in order to slow the bomb’s descent so that the plane has enough time to get to a safe place. The plane piloted by Andrei Durnovtsev dropped the Tsar Bomba at 11:32 AM Moscow time, from a height of 6.5 miles (10.5 km) over Mityushikha Bay in Novaya Zemlya. The bomb detonated at a height of 2.5 miles (4 km). The descent from the height it was dropped from until the place of the detonation at 4,000 meters above ground took 188 seconds, just enough time for the pilot, Andrei Durnovtsev to fly to a safe distance. Just one second after the detonation, the fireball was already 4 miles wide, and the light could be seen at distances of over 2,000 kilometers. The mushroom raised to a height of about 64 km, over 7 times the height of Mount Everest. In the video section of this site you can see some videos made during the detonation, and on the Map section you can see where exactly the ground zero is, as well as the route of the plane. After the explosion, the surface of the island was leveled, and the rocks melted. Some reports indicate that windows were broken in northern Finland and Norway too. Amid concerns about radioactive fallout, in 1963 the US, UK and USSR signed the Partial Test Ban Treaty forcing all nuclear tests to be underground.